Many of you know Lory, of Emerald City Book Review, as the creator of the Witch Week blogging celebration to honor Diana Wynne Jones. Lory announced last year that she was ready to hand over the reins to any interested blogger. We’re lucky (and grateful) that she was willing to be one of our guest bloggers this year. LORY WIDMER HESS shares her reading journey at www.emeraldcitybookreview.com. Books based on fairy tales and mythology are among her favorite things, along with long walks, knitting, singing, and chocolate. She came up with Witch Week five years ago as a new blogger, and still considers it one of the best ideas ever. For more information about (and images of) the infamous witch of Greek mythology, Lory recommends a read of Madeline Miller’s photo essay. 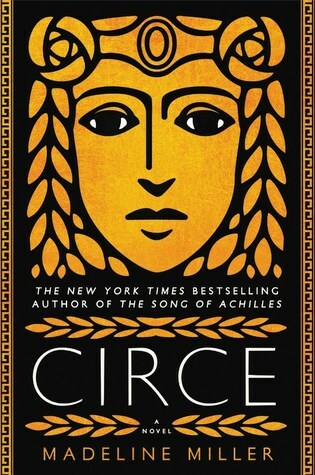 When I was casting about for a book to review for this year’s Witch Week, I hit upon Madeline Miller’s new novel, Circe, and knew it was the perfect choice. What better character to explore than one of the most ancient and famous witches of them all, with a charming propensity for turning men into pigs? As in her first novel, The Song of Achilles, Miller takes us on an immersive journey into the past that makes us see the Homeric world with new eyes. Riffing on a brief episode in Homer’s Odyssey, Miller fills out and expands upon her source material to convincingly build a setting and a cast of characters through which we can contemplate the nature of deity and humanity, destiny and freedom, love and fate. The first-person narrative begins with the childhood of Circe, divine offspring of Helios the sun god and his consort, a daughter of Oceanus the water-god. One might think such a lofty parentage would be of great advantage to the young nymph, but Circe is maligned by her mother for her unpleasant voice and appearance, and toyed with by her callous father. The halls of Helios are not a place of harmony, but of jockeying for power in a harsh world. When it becomes apparent that Circe and her siblings are a new breed of divinity who practice pharmakia – manipulating the herbs and other products of the earth into drugs and potions, rather than purely manifesting the forces of nature – there is horror in the halls of the gods. What to do with this dangerous, unpredictable new element? This was one of the most interesting ideas in the novel for me: that witchcraft originated in the divine world as a transgression against natural powers. I was reminded of the story of Cain and Abel, though played out here with divine beings rather than humans. Like Cain, whose sacrifice produced through working the soil is rejected by God, Circe becomes an outcast and exile, a scapegoat carrying off the shadow her bright father can’t bear to face. On the island of Aiaia she lives out her immortal days, haunted by one of her first magical acts, the transformation of the nymph Scylla into a terrible monster. But the Greek word used here for witchcraft also gave rise to our word “pharmacy,” suggesting that this power can be turned to healing as well as harmful ends. And spurred by an early encounter with Prometheus, who was terribly punished for helping humans, Circe begins to question some of the assumptions under which the gods live, and to develop her own quietly rebellious way of thinking and feeling. By the time Odysseus arrives on her island, she’s been through a great deal – including the birth of her monstrous nephew, the Minotaur. Her experience of the cruelty of monsters, gods, and human beings leaves her with an understandable tendency to turn men into swine, and to seek vengeance against those who hurt her. Yet unlike her brothers and sister, whose powers are used purely for selfish and evil ends, she tends toward a more compassionate moral stance. In Homer’s intriguing words, she speaks with a human voice – a mere phrase that Miller expands into a whole rationale for her behavior, and for a possible way forward into the future. Written in a measured, elegant prose, which echoes the past yet has a highly individual voice all its own, Circe’s narrative is a pleasure to read. At times it reads a bit too much like a “greatest hits” of ancient mythology, packing an incredible number of incidents and characters into its pages, but overall it succeeds in weaving together these scattered elements into a coherent, satisfying whole. 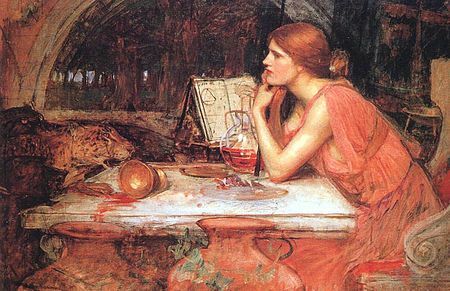 Feminist themes are implicit in the story of how Circe comes out of an environment of abuse and disempowerment to become self-determining, emotionally mature, and ethically strong. Educated by the pains and joys of motherhood, matched at last by a worthy partner, she journeys toward life and wholeness. It’s definitely an odyssey worth taking. This entry was posted in Fantasy, Feminism+Fantasy, Greek mythology, Witch Week and tagged Madeline Miller. Bookmark the permalink. Such a well-measured review, Lory, with your observations about Circe’s motivation and empowerment (especially after the bad press she has garnered over the ages) and your drawing attention to the role of pharmakia. You’ve convinced me that it’s worth my while to read this as well as Miller’s previous novel,and sooner rather than later! I agree, Chris. It’s evidently a popular book — I’ve had a request in at my local library for a month now and am still waiting for my copy. With luck, it won’t come until December, when I’ll have time to read it. I thought Miller did a remarkable job of bringing a modern perspective into this ancient tale, without making it feel totally anachronistic. I really appreciate that. That’s definitely a tough balance to create. Even metaphors have to be carefully constructed so that they don’t rely on anachronistic concepts. I’m glad to know Miller has done that well. I’ve suffered through a number of books where it is done badly, so I’m always glad to find an example of how to do it right.